Tabo is located at a height of 3050 metres in the magnificently isolated Spiti Velly of Himachal Pradesh. Founded in 96 AD by the great scholar, Richen Zangpo, as an institution for advanced learning, Tabo is seasonally accessible by road via Manali and Shimla. Tabo is another important tourist place in the Buddhist pilgrimage list, situated in Himachal Pradsesh. The place is more famous for the ancient monastery, believed to be built before the Alchi monastery, which has considerable similarity in terms of Kashmiri Art paintings, which might be due to their originality, and being routed to Tibetan Buddhism principles. The monastery is also important for being an interesting place to study the growth and flourish of Tibetan art during the 11th to 20th century. Himachal Pradesh, in itself, is a very attractive and soothing experience, adding to the goodwill of this monastery. The monastery preserves some of the most ancient murals that are worth a close examination for any archaeologist. Tabo, situated at an altitude of 3050 m, proudly spreads it charms in the Spiti valley, in the Lahauyl and Spiti valleys of Himachal Pradesh. The monastery has preserved some of the most antique paintings, especially the murals, which date back to 11th century, food for thought for both archaeologists and the religious monks. The iconoclastic attacks and the roughness of rough time overshadowed, these paintings are preserved in such a beautiful manner that they hardly seem to belong to the starting of the 11th century. The monastery has nine structures, the most famous of these being the Duwang Lakhang. Besides these, there is the four-faced magnificent Buddha idol, the amitay Buddha in seated position, a stucco idol of Bodhisttva Maitreya, and the huge Chaitya hall is really one of the finest examples of Buddhist sculpture and architecture. 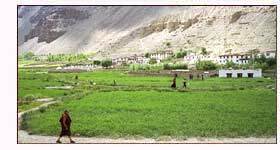 Dhankar - Erstwhile the Capital of Spiti Kingdom, this village has an ancient fort on the hilltop. There is a famous monastery, inhabited by more than 100 lamas. The statue of Buddha, in Dhyana mudra, four figures sitting back to back, is really interesting to note for the sculpture and architecture. 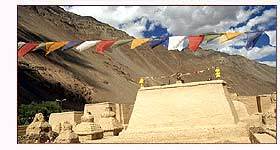 Kungri Gompa - This Gompa, though unexplored, serves to provide good examples of being an ancient Buddhist centre of learning, with some highly motivating natural scenarios that is particular about the Spiti valley, turns even the most rude into a religious devotee. Air - Kullu Manali is the nearest airport, connected to major cities of India, at a distance of 250 km from Tabo. Rail - Shimla and Pathankot are the nearest rail stoppages for Tabo. Road - Tabo could be reached by Road through three gateways. 3. From Ladakh via the Sing -O-la passes. If you want luxury, stay at Manali..